"Like all Southerners, we love our pork!" Preheat oven to 350 degrees F (175 degrees C). Line a baking sheet with aluminum foil and spray with cooking spray. Beat soy sauce, egg, water, garlic powder, and ginger together in a shallow bowl. Spread bread crumbs into a separate shallow bowl. Dip pork chops in the egg mixture, allowing excess to drip back into the bowl. Press pork chops into the bread crumbs until evenly coated on both sides. Place coated pork chops on the prepared baking sheet. Bake in the preheated oven until pork is cooked through, 50 to 55 minutes. An instant-read thermometer inserted into the center should read at least 145 degrees F (63 degrees C). 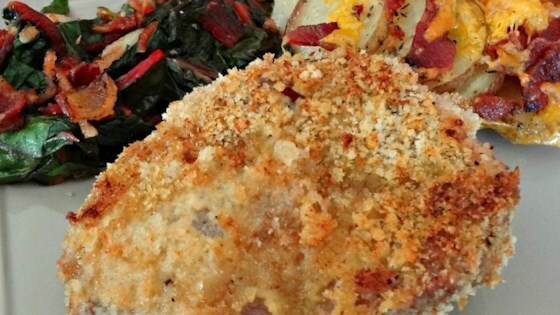 See a simple, inexpensive way to make tender baked chops. Great recipe, my family loved it. Sprinkled some parmesan cheese on the top before baking. Easy peasee! Had all the ingredients I added big splash of Worcestershire sauce. And dinner was a success .